I have a SeaStar Solutions control from 1989 and I need internal parts. Are any available? We do not make available internal repair parts for any of our control components. Proper field repair of these components is not possible. The only service parts offered are those listed in this catalog on the page with each control. Generally speaking, these are cable attachment/ hardware kits, neutral safety switches, handle knobs and other optional accessories. For some control models, we do offer additional service parts. If the repairs your control needs cannot be made, please replace it for safety reasons. SeaStar Solutions offers the most comprehensive line of marine controls available — it is likely we have one that is a drop-in replacement (or very close to one). An overview of our controls line and specifics on each model are shown earlier in this section. Usually the part number is stamped in white on the existing cable’s plastic outer casing. If you can’t locate it or read the part number, check to see what brand of control and brand/year of engine is on the boat now. With this information, you can determine which cable you need from identification/application charts in this catalog. These charts will help you identify cables by appearance, part number, control type and engine brand/type. For maximum performance, we recommend our Premium cables. Once the part number of the replacement control cable is known, measure the one you have now if at all possible. Please see “How to Measure Control Cables” in this catalog and take special note of how measurements are made. The most frequent reason for the return of a new cable is that the incorrect length was ordered. Yes, If you use the DS units shown on pages 167 and 168 of our catalog. a state-of-the-art mechanical control specifically designed to work smoothly in twin station boats. Single function controls for twin stations are set up with the cables “in series”. This means that each cable is run from one lever of an upper station control to the corresponding lever of the lower station control. Another cable is then run from the lower station control to the engine. When the cables are properly connected, moving the levers at one station will move the levers at the other station in addition to actuating throttle and shift. Shift detents should be used in the lower station control(s) (closest to the engine) only. Do not install shift detents in the second station control. these cables have very little backlash, so a high-quality synchronization of the control head lever position and feel at each station (including shift detents) is possible. If a mechanical control system cannot deliver acceptable feel or response, upgrade to an electronic control system. SeaStar Solutions has several options, ranging from the relatively simple KE-4a system to the fully featured i6000 family of controls. I want to add a station to my boat. What do I need to do? First determine the type of control system on your boat now. That will help you identify the options available to you. Measure the distance between stations and approximately how you would route the cables from one station to another. This will give you a starting point as to which components you may need and how long any cables might be. Generally speaking, if the run between stations is relatively short and uncomplicated, mechanical controls will do. (Please see previous FAQ for information about which kind of control is recommended and general installation parameters). If the run between stations is long or complex or there are more than two stations on the boat, mechanical controls are not recommended. Use an electronic control system instead. When adding a station, a substantial amount of components will be required no matter which types of systems are selected. If the boat has mechanical steering and controls, this is a good time to consider upgrading to SeaStar hydraulic steering and the KE or i6000 family of electronic controls. My control used to work fine, but now one lever is hard to move. What should I do to fix this? a. Disconnect the cable at the throttle or transmission attachment point. Move the throttle or transmission arm through its arc to be certain there is no restriction or binding. If the arm is stiff or binding, clean and lubricate moving parts. If this does not solve the problem, make the appropriate repairs. Generally, the force required to move a throttle or shift arm should be no more than 5-10 pounds. b. With the cable disconnected at the engine end, try to move the control lever. If it moves freely, the problem was the throttle/transmission arm. If the control handle is still hard to operate, disconnect the cable from the control. If the lever operates smoothly, the control cable needs replacement. If the lever is still hard to move, lubricate the lever pivot point in the control with penetrating oil and a light grease. c. If the problem is with a throttle lever, you may have a cable brake installed to limit cable feedback to the handle. If this is the case, loosen or remove the brake. If throttle lever creep back is a problem on the boat, you should consider installing a SeaStar Solutions CH5600P SLT control. This unit will stop cable creep without sacrificing a smooth feel. How does the CH5600 Work? Each control lever has both a self-locking and direct drive lever arm. The cable from the engine throttle directly to the control should be connected to the control’s self-locking lever arm. The cable from the transmission should only be connected to the control’s direct-drive lever arm. Cables between stations should only be connected to the direct drive lever arms of those controls. When a cable from the transmission or a “slave station” is connected to the direct-drive arm, it will allow the control lever to be moved from another station. Cables from the main station to any additional stations must be attached to direct drive arms on those stations. 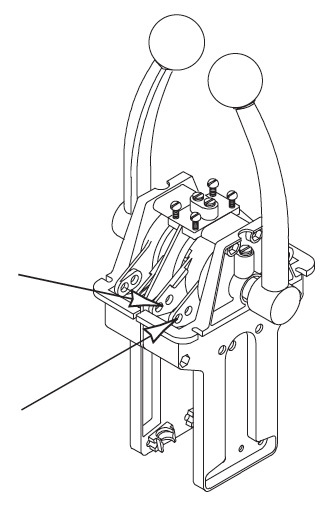 When a cable from the throttle is connected to the self-locking arm (black in color), it will only move if the lever is moved; engine vibration and return spring feedback will not move the control lever. 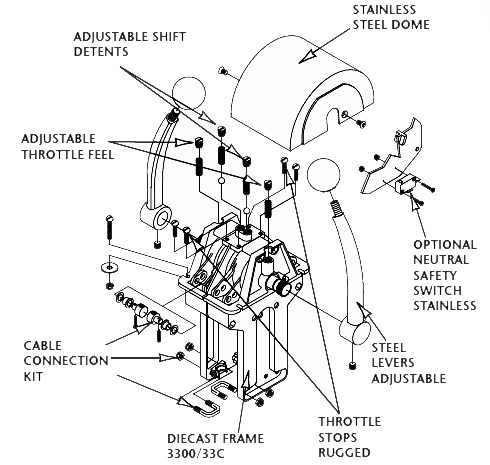 Only throttle cables routed directly from the engine to the control should be connected to self-locking lever arms. This exploded view diagram shows key components and features of the SLT top mount control. The SLT can be configured as throttle/shift, throttle/throttle, or shift/shift. This control is designed to work well with virtually any 3300/33C type universal cable. For superior results, use SeaStar Solutions cables. For a list of part numbers for available options and replacement items, see the CH5600 pages earlier in this section. How do I Set-up the CH5600? Each SLT can be configured for Throttle and Shift, Twin Throttle or Twin Shift, simply by screwing in the appropriate throttle stops, detents and knobs that come with the control. Shift cables must always be connected to the direct drive arm, regardless of which control station. The SLT can be used in Single or Twin Station applications. Dual station setups must only utilize the Self- Locking feature, shift detents and throttle stops for throttle at the station whose cables are directly connected to the engine. All cables from the “master” control to the other station(s) must be connected to the direct drive arms of secondary control(s), which must not have active throttle friction or shift detents. Multiple stations require that the controls be hooked in series if the Self-Locking feature is used. NOTE: This is the only twin station mechanical control that allows you to take full advantage of cables’ superior performance characteristcs. You can use the ultra-smooth cables without requiring a cable brake or other device to limit unwanted lever creep. Cable brakes and similar devices tend to denigrate cable performance and degrade the feel of the control when the levers are moved. How do I know which control cable I need? In order to determine that, you need to know what brand(s) of engine and control head are on the boat. Mercury/Mariner/Force and OMC/Johnson/Evinrude engines usually require an “OEM type” cable when using those engine makers’ control heads. OEM type cables have special end fittings designed to connect to the control and engine with minimal hardware. Generally, all other engines and controls use a “universal” 3300/33C type control cable. Universal cables have 10-32 threaded ends and often require extra hardware to connect to the engine and control. Contact the engine manufacturer if you need details on the hookup. Diesels and twin station vessels may use larger diameter (4300/43 or 6400/64 type) universal cables; 4300/43 type cables have 1/4-28 threaded ends and 6400/64 cables have 5/16-24 threaded ends. Refer to the “Control Cables” section of this catalog for more information. How do I know which control cable length I need? a. Are you doing a first-time control cable installation? Outboards: Measure from control along unobstructed cable routing to center of outboard. Add four feet to allow for loop which provides unrestricted engine movement. Round up to next whole foot and order that length cable(s). Stern Drives and Inboards: Measure from control along unobstructed cable routing to shift and/or throttle connection. Round this dimension off to the next whole foot and order that length cable(s). b. Are you replacing an existing cable? Measure the Existing Cable as Follows: Measure the cable from tip to tip in inches, and round up to next even foot. Order that length cable. What kind of ongoing maintenance do cables need? Can they be repaired? a. Check overall operation for proper gear engagement, full and idle throttle, and overall feel. b. Visually inspect control head, cable as well as engine and transmission cable attachment points for proper tightness of fasteners, correct operation of all moving parts, worn or broken items, cable chafing or misalignment, etc. c. Do not lubricate core wire (moving wire inside the casing). If the cable operates stiffly, replace it. d. Keep cable ends dirt and corrosion free. e. Lubricate pivot points and sliding parts of the cable with a good quality water-resistant grease. a. Excessive free play felt at the control even after all cable connections have been verified as in good working order. b. Visual inspection shows chafing, breakage or bent, loose or worn parts. Never attempt to repair a cable. Always replace a malfunctioning cable. A cable cannot be properly repaired in the field and must always be replaced as an assembly. Attempting to repair a cable can result in control system failure, leading to personal injury and/or property damage.